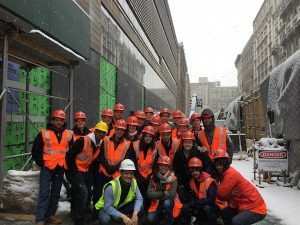 With the fourth Nor’Easter of the season covering the city of New York with snow, we were only able to visit one of our two site visits for the last day of the GLCM trip. We visited Barnard College to meet with members of Turner Construction. Here, Turner was working on a new LEED Silver teaching and learning center in the center of the college campus. 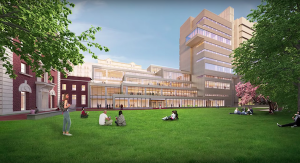 The new facility, which was designed by SOM, will replace the old library and will include classrooms, offices, library space, cafes, and other services for the all-women college. At the start of the tour, we met Nicole, a field engineer who gave us some background on the construction project. The project included the demolition of the pre-existing 4-story library and the construction of the new, 12-story facility. It began in 2016 with the initial demolition, and it is scheduled for completion by this upcoming summer. With a total cost of around $110 million, the structure is designed with the first 5 floors maintaining a larger footprint to resemble a podium, and the remaining upper floors to shrink in size. The reduced area of these upper floors forms the buildings tower. Our main tour was led by Matt, a field engineer who focuses on the project’s MEP work. 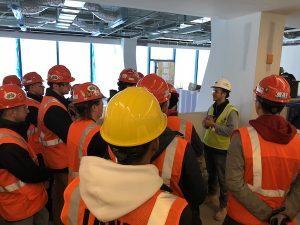 During the tour, he explained how there was a strict rule that no members of the construction side of the project, including laborers or management, could interact with the college’s students, faculty, etc. 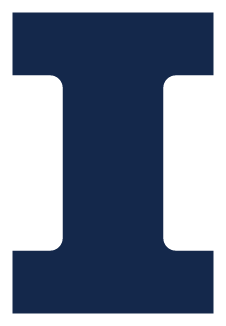 The college wanted to ensure no information regarding the project was misconstrued by the public, so all updates and information was to be distributed by the college itself. To prevent this, only one gate was available for deliveries, and all workers on site had to enter through one of two designated entrances. The site was also surrounding by fencing, some of which was covered by paneling or fabric, to prevent the public from entering the site or seeing in. Matt talked a lot about the team’s focus on safety and project coordination methods. Every morning, the foremen meet to discuss the day’s schedule and any coordination efforts that need to be made. The site is designed with LEAN methods in mind. So, some floors of the building, such as the 4th floor, were designated storage and staging areas. Here, each subcontractor had a small area designated for them to organize materials. 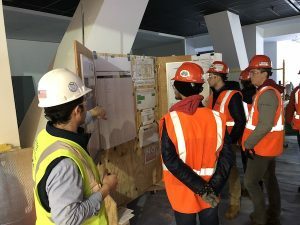 The project superintendents are assigned to specific floors to continuously monitor safety of the laborers, ensure use of PPE, and check on progress. At the time of the tour, all the MEP had been installed, so Matt’s main focus at this point was commissioning all of the systems. This includes testing and maintenance of the systems like the fire pump test that had been completed the day prior. He mentioned that some of their main challenges, which are also common on most any construction site, included the general coordination of subcontractors. 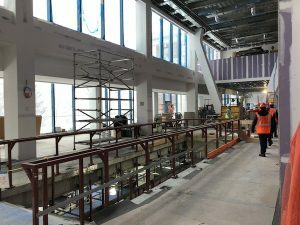 As is important for all projects, the subcontractors need to be on the same page to ensure a successful project, so Turner uses BIM to coordinate all MEP work. As a newer member of Turner’s team, Matt was a great resource for us as students, to gain some advice about choosing our first job after graduation. We thank Nicole, Matt, and all of the Turner team for hosting us. 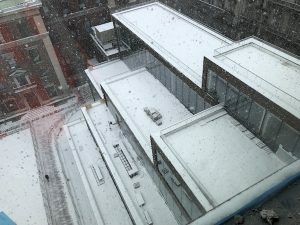 Because the weather cut our trip a little shorter than expected, the rest of the day was spent enjoying the sites and experiences of a snowy New York day. A few of us enjoyed lunch at Joe’s Pizza, a pizzeria famously known from Spiderman where Peter Parker once worked as a delivery boy. 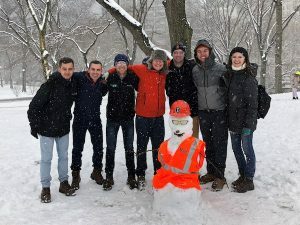 Later, we took a stroll through Central Park, built a snowman, and enjoyed a snowball fight with some visiting high school students (we were easily demolished by them). The evening concluded with some students heading downtown for a night at the opera or a show on Broadway.